Tokens are a thing that we love to use to bling out our decks. It’s a way to show off, by having nice tokens, or prepared for the number of tokens you need when you play with your cards. 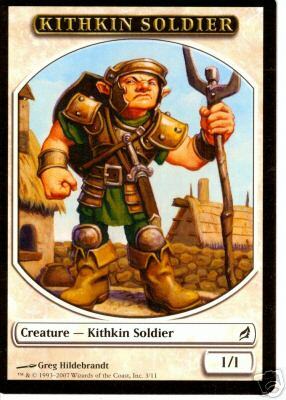 If you’re playing a deck that can make ten Kithkin soldier tokens, having those tokens on hand is both convenient and kind of cool, plus it lets you make more careful decisions about what they’re doing. What if you play bigger or slower formats, though? Things like multiplayer cube, or commander, or just big multiplayer games of conventional type, or weird formats where stalls happen like in Canadian Highlander? I’ve seen people use dice, and that can have the problem of not knowing when tokens are freshly arrived (and can’t attack), or which are tapped or untapped. If you put six Angels on the battlefield, that can occupy a lot of board space, even if each angel doesn’t actually need to do that on the table. Here’s the basic idea. The spaces on the corners are designed to be printed at the size where most common six-sided dice (which range from 16mm down) fit neatly and clearly. There’s a texture in the background to give you a colour (and I could work on signifying that with other ways), and these three slots are so you can increment the count reasonably easy. They’re also separated from one another pretty broadly – so if you do get much more than six of each token, you can add more dice without it ambiguating the corner of the card the dice is resting in. This is going to need some art and revisions of textures – but this is the basics of the design. 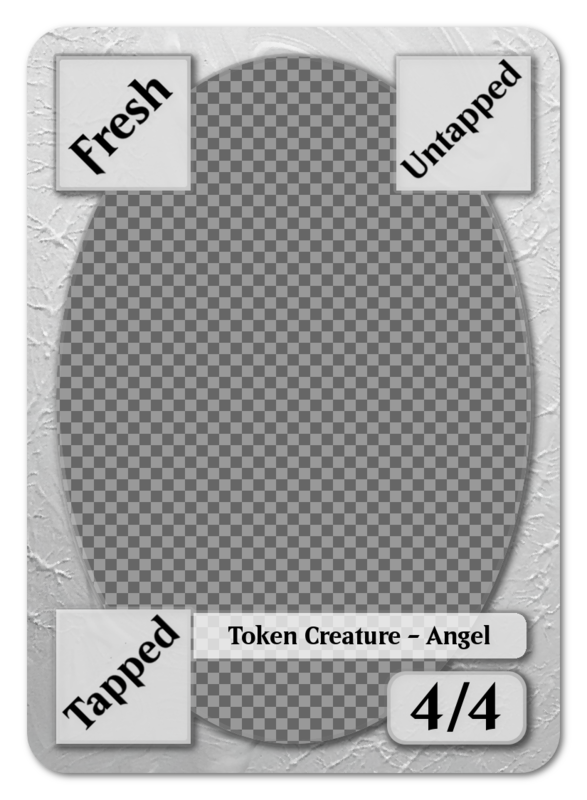 The next step after this is finding good art, getting some good colour distributions for a broad type of tokens, but more than most tokens, maybe fishing around for alternative fonts (this is a lookalike font that’s free for use, but that’s a bit of a grey area) and alternative frames for the art.